I was pleased to notice that one of the upcoming releases from the FTD collectors label will be a CD titled Stage Rehearsal. Dealing mainly with Elvis' show rehearsal at the International Hotel in Las Vegas on August 10, 1970, it offers a couple of bonus rehearsal tracks recorded on the same stage during other engagements as well. 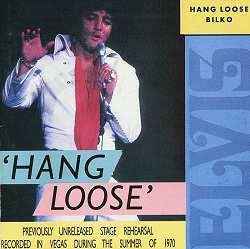 Basically, the album is an upgraded version of the bootleg CD Hang Loose, released in 1991 by the Bilko label. Studying the complete track list for the rehearsal, published in FTD's first audiovisual documentary The Way It Was (page 21), I noticed that "You Lost That Lovin' Feelin'" (released back in 1980 on the Elvis Aron Presley box set together with "Sweet Caroline" from the same rehearsal) was not included on the bootleg. Then, comparing the list with the Stage Rehearsal CD, I was a bit surprised to discover that not only is one take of "Polk Salad Annie" missing on the upcoming FTD album, but also a take of "I''ve Lost You" (two takes of each song are featured on the bootleg Hang Loose). Here's for hoping the track list presented by FTD is incorrect and that the two songs will be included. 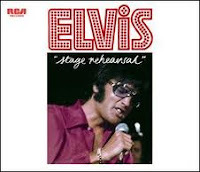 I know I'm not alone in looking forward to this release, and if the sound quality is anything like it is on the Elvis Aron Presley box set (a vast improvement over the one offered by Hang Loose) we should have a winner. A final thought. I wonder why the August 10 rehearsal wasn't recorded in its entirety? As it is, all the tracks are labeled "Incomplete - Late Start." Strange, isn't it?